Ikea’s genius Instagram marketing agency teases collaboration with Kanye West. As long as you’re not Beck or Taylor, Ikea has your home décor for the next decade sorted. 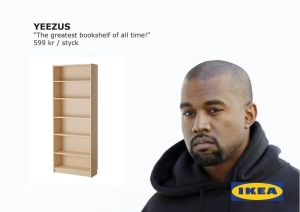 I think I speak for all of us when I say that a Kanye West and Ikea collaboration is the stuff of dreams. …Ok maybe more like nightmares but still. We all love Ikea so it’s not shocking that Kanye likes to shop there too, what is surprising is that he wants to work with them. West had hinted a couple of times that he wanted to work with Ikea, predominantly on twitter. He even went so far as to post an image of a bed design he was making. Later in an interview with BBC Radio One he stated that people would want furniture created by him, directly calling out Ikea in the process. BBC Radio One has been host to some odd things but this was nothing as simple as live lounge. However it was Australia that had all the fun this time. Ikea Australia posted a facebook photo for a new bed design- the Yeezy. They continued to tease Kanye by saying they would ‘love to see what he would create.’ While I’m sure this thrilled Kanye, the internet is apparently filled with vigilante interior designers who took the challenge upon themselves. They created new furniture designs with plans big enough to rival Kanye’s ego. Some highlights were the Kardash—a double wide chair as a homage to Kimye, Yeezy fishsticks (a continuation of the glorious Yeezy bed line), and of course a Frameye or two. It is the Kanye West furniture that is the Kanye B est. While Ikea remains Ikea for now, Ikanye is an inevitable future for which we can all thank the internet gods. This isn’t the first time Ikea has done something random and entertaining, so we have to give major credit to Ikea’s Instagram marketing agency for making our day just that little bit yeezy-er (and obviously inspiring our new home décor.) Obviously this is a great publicity stunt on both sides. Having a collaboration is great for branding as it gets fans from both demographics to potentially purchase the end product (or in this case consider purchasing products from the individuals). Additionally it creates an image or idea that people associate them with, making it more recognizable. As brands Ikea and Kanye are already well established the joke collaboration is even better for developing a polished multi-brand image. Well played, Ikea, well played.